I recently wrote an article about laundry detergent pacs, and when I shared it on SR101's Facebook Page several people shared their thoughts and opinions about a new product, Tide Pods, including having a discussion of how well (if at all) these pacs dissolve in cold water. I just bought some of the ALL gel packs, but I got the clear ones. Kinda wondered about this happening! I have used the Tide stain remover pods and had issues with them not dissolving all the way in the washer. I called Tide and they told me that since I live in a cold climate area, that in the winter months I need to wash in warm water to get them to dissolve all the way. Just makes me wonder if these will have the same effect in my washer since I prefer to use cold water all year. I have used the Tide ones and they work great! Have not had any troubles at all. Thanks so much for these ladies allowing me to share their words and experiences here. I'd love to hear from even more of you, telling me what you think about these pods, and why. You can share your own review here, or read other reviews of Tide laundry detergent that have already been submitted. 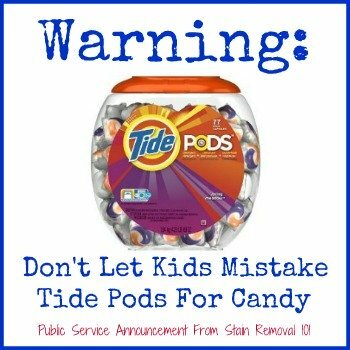 I just read an article about Tide Pods, the newest type of packaging of laundry detergent from Tide, and wanted to share this warning with all parents, grandparents and child care givers who may consider using them, or who already do. Your kids may think, because of the packaging of both the bowl shape, and the multiple gel looking colors within each individual laundry detergent pac, that they are candy and try to eat them. I guess, to an extent, all laundry detergent pacs (and dishwasher detergent pacs too) may suffer from this problem, and to that extent it is a good reminder for all us parents to keep all cleaning and laundry supplies out of the reach of children. However, I do believe that the colorful design and fish bowl packaging makes these pods even more susceptible to this problem then others. Several children have been hospitalized for days after swallowing the detergent, but no deaths have been reported. The capsules have the potential to cause harsher symptoms than regular-old detergent ingestion because each packet contains a full load’s worth of the cleaning product. To try to fix the problems, at least in the short term while it reconsiders packaging further, Procter & Gamble stated it would add a double latch to the lid of the box. This will, of course, just make it more difficult for a child to get the detergent, but will not address the issue of it being enticing in the first place. Do you guys have any other ideas and suggestions for child safety in this regard? In addition, I would love to hear your own experiences, good or bad, about Tide Pods, either in regard to child safety but also the way in which they work. You can share your Tide detergent review here, and I already have on short review below. ***Update 1: I got this very sobering comment today from a reader, who stated. My child is in the ER at this moment. What irresponsible packaging; made to look like candy and sold in things that look like candy jars. What are they thinking? I hold P&G entirely responsible for this. This is just another reminder of how precious our children truly are, and how we've got to take reasonable precautions to protect them from harm. 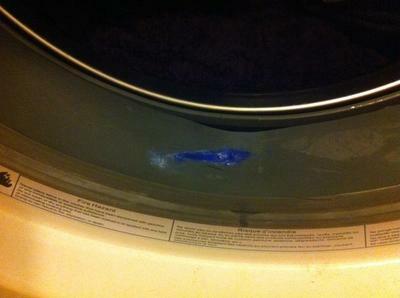 D. Hardaway shared this picture of the problem she's been having with these laundry detergent pacs. She has a front loading washer, and the Pods are not dissolving properly when she uses them, which means she finds the remains of the pack stuck to the gasket when she opens the washing machine at the end of the load. Has anyone else encountered this problem? If so, were you able to fix it? Is there a certain technique people should be using when use this product in their front loading machines? I'd love to hear from others about this issue, so if you've got tips, suggestions, or have the same problem tell me about it here. Cas shared her experience with this product as it relates to those who have front loaders, also known as HE washing machines. Tide Pods are certainly dangerous for children. My heart aches for those children and their parents. However, a word of caution to those who have HE washers. The pods have more suds, which is not good for HE Washers. 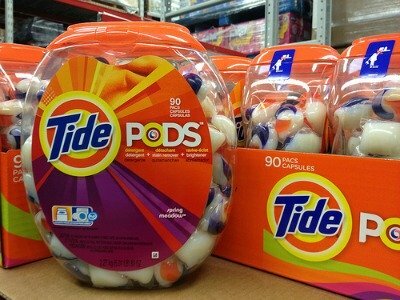 I will be donating my container of pods and going back to Tide liquid for HE. The warranty on the washer is not valid if the suds damage the washer. Thanks so much for sharing your experience Cas. I was immediately interested in your comment, because you're right, you need to use a soap with lows suds, which is HE compliant, in your machine to keep it from getting messed up. I've written an article all about high efficiency laundry detergent here if anyone is interested in more information about this topic. I am surprised to hear, however, that you think it might harm your machine. Despite the fact that all Tide products are so expensive, I've always felt pretty comfortable with the fact that none of them will ruin my clothes, or in this case a machine, if it says it is HE compatible. 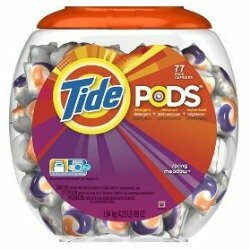 Therefore, I did some research about the Pods on Tide's website. What I learned is that P&G claims that the product works in all types of machines, meaning it is dual compatible. Normally such claims are thoroughly tested in the labs to make sure they are true, for both legal and practical reasons. So, if you've had an experience, positive or negative, with this product in use in HE machines, please share your experience with me here. I absolutely LOVE Tide Pods! I keep my cleaning supplies on a high shelf in the laundry room. More than once the Costco sized bottle came crashing down when the washer was unbalanced. The cap would always break and send detergent around the room. A mess to clean up! I also frequently let people who don't have the money for the laundromat or have a broken machine use my washer and dryer in a pinch. They always seemed to use too much detergent! This has to be hard on my front loader. When I tried the sample pack of Tide Pods I was sold. No more overuse of detergent. I have always been able to clean a load perfectly with one pod. They clean better than the Costco brand liquid. I have been using the Pods since shortly after they were introduced. By the way, I have pretty sensitive skin, but have not been bothered by them. Mike has also shared his review of this product. I'm using the new Tide pods now. Although I was a bit put off by the price at first, they have turned out to be a much better option then the bottles of liquid detergent. Yes $20 sounds like a hefty price tag but since you actually get the exact number of loads listed on the package it turns out to be cheaper in the long run. I buy the Pods maybe once every 5 weeks or so. You get the great cleaning power of Tide, the brightener and the wonderful scent all in one tiny pod of detergent. I'll be sticking with Tide for now until Gain decides to offer some of their great scents in pod form. Thanks Mike for sharing your experience with these laundry detergent pacs with me. You can read more laundry detergent pacs here, or share your own. Please also note that I've gotten several reviews from readers who've experienced allergies and itchiness when using these pods. Dissolved near white shirt and left blue stains ruining the new shirt!! When I used the Tide Pods the first time they left white crud all over my clothes. The second time, same problem. They just didn't dissolve properly. I know lots of people like like them but I'm not one of them. Nor do I think they look like candy.